Sydney Mazda | Blog | Sydney Mazda Takes Part in Super Hero Day to Celebrate Little Super Heroes Fighting Big Battles! Sydney Mazda Takes Part in Super Hero Day to Celebrate Little Super Heroes Fighting Big Battles! “Not everyone is meant to make a difference. But for me, the choice to lead an ordinary life is no longer an option.” – Peter Parker, Spiderman. 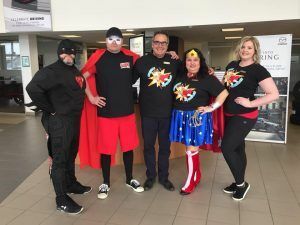 On Monday, March 25th, our team dressed up in their favourite Super Heroes, and wore their Caleb’s Courage T-shirts to help bring awareness to kids in Cape Breton fighting childhood cancer. Our very own Wonder Woman, Melanie ‘Mazda Mel’ Sampson was ready for her close up for CTV News! We want to thank everyone that participated and came in for a test drive to support Caleb’s Courage! For more information about Caleb’s Courage, click here.